cut me off @ 2. Now that I look at @Fuzzlr's profile, I need to introduce you to Duct Tape and how it will end your problems with typing to the point where you could've been banned for saying the same thing four times in a row. Toastie and Natsu like this. AdrianIsEpic and Toastie like this. you? are? actually? 18? adiran? what? Natsu and Pmx728 like this. he's 10. Trust me, that "age" of his is a mask. Is Adrian epic?? Must confirm. Gotta Love The New Font. Natsu and CatLord707 like this. Flashback: meepcraft.com/threads/meeps-old-spawn-as-a-new-airship-location.59983/ One of my oldest posts. Hey do you like oxygen? TheTrueScruffy and Natsu like this. Wrong he has 309 likes!!!! OH NO YOU GOT ME!!! MoonlitMadness and Garde7 like this. You have been awarded "Can't get enough or your stuff"
You know I should train myself in Halo. I used to be good at this halo-like game called fatkid but I was 13 years old back then. 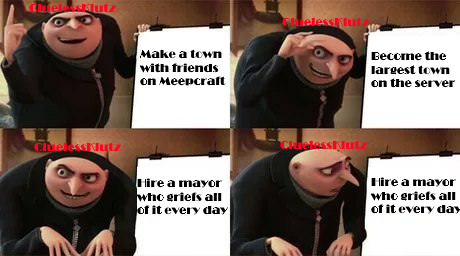 As a mayor in Legend, I've gotten to do quite a bit, helping @AdrianIsEpic with his "projects."